Welcome to the first New Build Steam news round-up of 2016. It’s been a busy start to the year for many projects, as well as seeing major developments on the main line (covered at the end of this post). These news round-ups will continue as normal for the first half of 2016, after which we hope to bring you more regular and more varied content as we build up to the expected completion of several locomotives from late 2017 onwards. The overhaul of the Saint’s boiler is now complete, with the insurance company having undertaken a cold inspection on October 15th and a successful hydraulic test by the group to 300psi having followed a fortnight later. The boiler has now been given a coat of protective aluminium high temperature paint and placed aside, awaiting the completion of the official hydraulic and steam tests when the rest of the locomotive is ready to receive it. The cladding sheets and insulation lagging were expected in January to be ordered soon. Other work reported in the project’s January update includes the completion of the tender, barring fine detailing and painting, and the fabrication of the crinolines to support the boiler cladding sheet. The Clan project has set a strong pattern of weekly news updates on their website so far this year, with regular details of new components arriving and new orders being confirmed. The final component necessary to allow frame assembly to start has now been ordered: CTL Seal in Sheffield will fabricate the smokebox saddle and integrate the exhaust steam spider, on order from the Boro Foundry. Other recent updates show, among other developments, that CTL Seal have also fabricated the vertical frame stretcher and boiler carrier. Following news of the construction of the cab late last year, the P2 has now had its cab trial fitted – marking the first time for over 70 years that it has been possible to stand in the cab of one of these locomotives, albeit currently with rather less to see when looking forward than in 1943. Other work to fill that gap has included the fabrication and fitting of the splashers, and pattern fabrication for the Kylchap double chimney – the latter a particularly expensive and time-consuming job for the South Lincs Foundry. As at February 5th, the patter was available to be sponsored for £2,400. Although the news section of the LNWR George the Fifth’s website has not been updated since February last year, trustee Paul Hibberd confirmed in a comment on December’s update that progress continues to be made. As at December 30th, the riveting of the smokebox had nearly been finished, an order for the casting of the bogie wheels was due to be placed in the new year and a study had been commissioned to look at the impact of the loading gauge of today’s main line on the draughting of the locomotive. The Trust has also secured an LNWR brake coach as storage in the short term, and ultimately a complement to the finished locomotive. The Patriot project continues to post updates of major progress, as it maintains its push for steaming in autumn 2017. The latest milestone is that the locomotive is now a 4-6-0, after the fitting of the bogie on February 4th. Photos are available on the project’s website, and a short video clip of the engine being shunted on Facebook. Progress is also being made on the boiler and firebox: plates for the inner firebox assembly have been drilled prior to assembly at LNWR Crewe and the outer firebox wrapper sheets have been welded at Deepdale Engineering prior to delivery to Crewe. This photo on Facebook shows the outer firebox crown and sides riveted together. The two barrel rings will be riveted together when there is capacity in the works. Fundraising still continues, with £1.35 million raised, and £500,000 still to be found. The project has today launched a new ‘Sponsor Our Stays’ appeal to secure funding for the 355 copper stays (at £20 each) and 955 steel stays (at £7 each) needed for the locomotive. Sponsorship has also been obtained from Morris Lubricants, suppliers of steam heritage lubricants, who have contributed to the cost of the bogie, are providing metalworking lubricants during manufacture and will also provide the necessary specialist lubricants for the operation of the locomotive. Numerous new parts and services for the G5 are now on order, including the machining and fitting of the motion bracket to the main frames, the machining of the axlebox housings and the manufacture of the smokebox. The group has also resumed activity on its Facebook page after nearly three years, and used one post to give a reminder of how the project is financed and ways in which supporters can help: these include buying shares or becoming a Super Friend of the G5. The next aim for the Footballer is to fit straps and handles to the smokebox door, re-paint it and then add it to a smokebox and buffer beam to complete the front of the locomotive. A set of buffers is already in stock from the scrapyard in Doncaster that also yielded the tender, and a set of BR Eastern Region locomotive headlamps have been acquired at auction. Meanwhile on the internet, the project now has a Twitter account (here in its own right, and added to the New Build Steam projects list), which seems to tweet at least as much about football as about railways – but one of the nice things about social media is that it is possible to see different new build groups interacting, as in this exchange with the Patriot project. The football connection is also yielding some funds, with a signed Wayne Rooney shirt and match football donated by the curator of MUFC’s museum. They are being auctioned, with the first chance to bid going to members and supporters – it is open until March 19th, with details in this newsletter. The Claud Hamilton group is another to break a period of silence on one of its news channels, with the first update on its website since March giving details of some recent CAD work. The chassis of the Brighton Atlantic is nearly complete, and attention will soon turn to the boiler. Most recently, more work has been undertaken on the valve settings: with the driving wheels still on rollers, it is proving possible to ‘turn the engine over’ using just a ratchet spanner with a piece of tubing on it. Once the valves are set, the coupling rods will be added. Other late work on the chassis has included more pipe runs, to take steam to the sanders. The Grange continues to see progress on regular working weekends. This report details one such meeting, with work on the brake gear and the addition of primer and undercoat to the front footplating. There has, as ever, been plenty of progress on 82045. The driving wheels for the 3MT tank have now arrived at Bridgnorth from South Devon Railway Engineering. The cab is currently on the chassis for construction work to take place, but will be removed again for further work. The boiler barrel sections are ready to go into the boiler shop. The group’s AGM will be held on April 9th in Kidderminster. Back to the Bluebell, the 2MT group is undertaking a push to wheel the locomotive: the wheel sets are being painted, and the coupled wheel axleboxes have been overhauled. Riveting has been completed on the front drag box and buffer beam, and also on the frame stretchers below the cab. Meanwhile, an agreement has been reached to swap pairs of return crank forgings with the Mid Hants Railway: a pair to suit a standard Class 4 will go to the Mid Hants, and a pair for a Class 2 will be made available to the group at the Bluebell. Plans are also advanced to clear space next to Atlantic House to erect a poly-shed for the group to move into. Two stories have seen main line steam operations in the news so far this year, one for good reasons and one for bad. The negative news is of course the ORR’s decision to impose a Prohibition Notice on the West Coast Railway Company, preventing it from operating any train on the main line. The full letter to WCRC (PDF) includes some remarkable criticism of the company, and its chairman specifically. Many railtours have been affected, and a resolution that ensures adequate operation of main line steam workings, whether by WCRC or others, has yet to emerge. The short-term impact of this on new builds is of course limited, with only Tornado currently operational and WCRC having already declined to operate it some time ago. Even the A1’s operations are being affected somewhat, however: the Red Rose tour on Valentine’s Day had to be re-routed after Network Rail refused to let 60163 take twelve carriages plus support coach over Sapperton Bank without diesel assistance. Attributing this to, “extreme sensitivity regarding train length limits,” on account of, “several well-publicised incidents involving steam trains,” the A1 Trust opted for a change of route and timings rather than have diesel assistance. Tornado had an incidental role in the more positive news story, however, as its support coach was loaned to Flying Scotsman for the latter’s official return run on the main line, from King’s Cross to York. The video below shows its earlier running-in railtour over Shap. Although Scotsman is not a new build, the scope and cost of its overhaul makes the project significant to new builds in proving the extent of work that can now be undertaken in the UK – for instance, the firebox and boiler, bar the barrel itself, are all new. With this and the work in progress on, for instance, the boilers of 45551 and 82045, it’s beyond doubt that the preservation movement in the UK is now confident in undertaking even the creation of a major component such as this from scratch (or very near it). 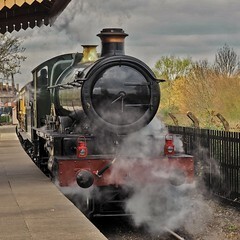 Re LNWR 2013 ‘Prince George’, see the new smokebox at Quorn GCR over Easter, Friday through to Monday. There will also be a joint meeting with the LNWR Society at 2pm on 9 April at Stone Staffordshire for supporters. There will be historical coverage and a presentation on the new build project. The pattern for the four bogie wheels and their casting was ordered from Boro’ Foundry on 1 February.